Carriers will sell you on things like discounted phones at prices as low as a penny to get you to commit, because if you bought that same phone without a contract, you would pay upwards of $600. The problem is, they may be allowing you to walk away with a new phone for next to nothing, but you are still paying for that phone each month with a built-in, behind-the-scenes subsidy cost (think of it as a really bad loan). So each month, you are paying for that phone with a charge that won’t show up on your bill or ever receive a mention from your carrier of choice. By the end of your service agreement, you will have paid for that phone little-by-little, month-by-month, you just might not have realized it (ever wonder why your ETF lowers after each month?). The problem is, that once your service agreement is over and that phone has been paid off, your carrier won’t cut the subsidy cost out of your wireless bill, so you continue to pay for that phone over and over again. See a problem there? We have preached for years now that you are better off never signing another contract or buying a phone on subsidy with a carrier, but we also understand that not everyone can pay the full price for phones upfront and that you were still getting screwed by these hidden costs anyway. Thankfully, carriers like T-Mobile have attempted to do their best to change the way this all works. For example, T-Mobile has separated phone payments from service payments, so you now pay for your phone via monthly payment plan that can eventually end once the phone has been paid off. You don’t have a built-in subsidy cost that never goes away. In other words, once your phone is paid off, that cost to you is gone and you are left paying for just your wireless service. This is the way it should have always worked. But again, that subsidy cost has been hidden forever, deep within contracts and is only recently being pulled apart as the scam that it is. AT&T and Verizon have followed suit somewhat in this area by offering up monthly device payment plans like AT&T Next and Verizon Edge. They give you per line discounts if you sign-up for these monthly plans, which is basically their way of pulling out that cost. Now, they are still locking you in to monthly payment plans and keeping you with them, but you won’t be double charged for a phone like you are with a standard contract. The entire industry is moving away from 2-year contracts, because they are nothing but terrible. As PCMag noted in an article earlier this year, even carriers would love to get out of the subsidy game. 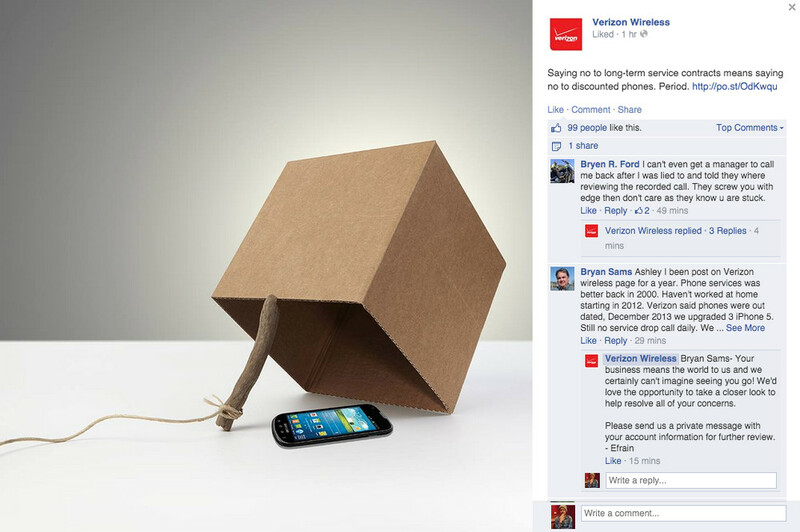 Which brings me back to Verizon’s post to Facebook today, which reads “Saying no to long-term service contracts means saying no to discounted phones. Period.” I’m not sure I have read a more insensitive or out of touch line in a long, long time. Period.